So, February has been just as incredible as January was! We’ve done another interview, with singer-songwriter David Ford and been to review The Japanese House‘s gig at The Haunt in Brighton as well as shared a whole heap of songs. We hope that you have enjoyed this month’s songs and you can find both the Spotify and YouTube playlists below! We hopefully have a couple more interviews and gig reviews lined up for March too, including Lucy Spraggan and MEST, so keep your eyes and ears peeled. As always, please keep sharing our posts and remember to share your song choices with us by commenting on our posts or talking to us on Twitter and Facebook. KStewart has a voice to be reckoned with; her vocals can be saintly sweet or devilishly dynamic and that’s a great thing! Her musical style has some 90s vibes to it, but she’s throwing in house and garage tones to shake things up a bit! This latest song is helping to cement just how fantastic she is and makes me even more excited to hear an album from her. The video is a collaboration between her and New Look – I think it’s a fantastic direction for both parties – fashion promoting music and music promoting fashion – it’s a match made in heaven! You’ll also notice MNEK making an appearance in the video too. It just looks like a whole load of fun, but where KStewart is concerned, I would expect nothing less! Show your support for this song and please download it – great tune! I’ve featured Sigala on Muzik Speaks, twice already, but I just can’t get enough of his summery dance vibes! With ‘Easy Love‘ and ‘Sweet Lovin’‘ already grabbing people’s attention, there is no doubt in my mind that ‘Say You Do’ with get a great reception on release; not only has he got Imani on the vocals, adding that sweet sound into the mix, but none other than DJ Fresh has dived in to help on the production. It’s one MONSTER of a song; very reminiscent, vocally, of ‘Hot Right Now’ (featured on our Summer Songs 2015 Playlist), the smash hit for DJ Fresh. The video is typically Caribbean which goes perfectly with the vibe of the song! I just love this tune – I really hope Sigala will release an album of hits, just like this; it’s upbeat, fun and smile-inducing! 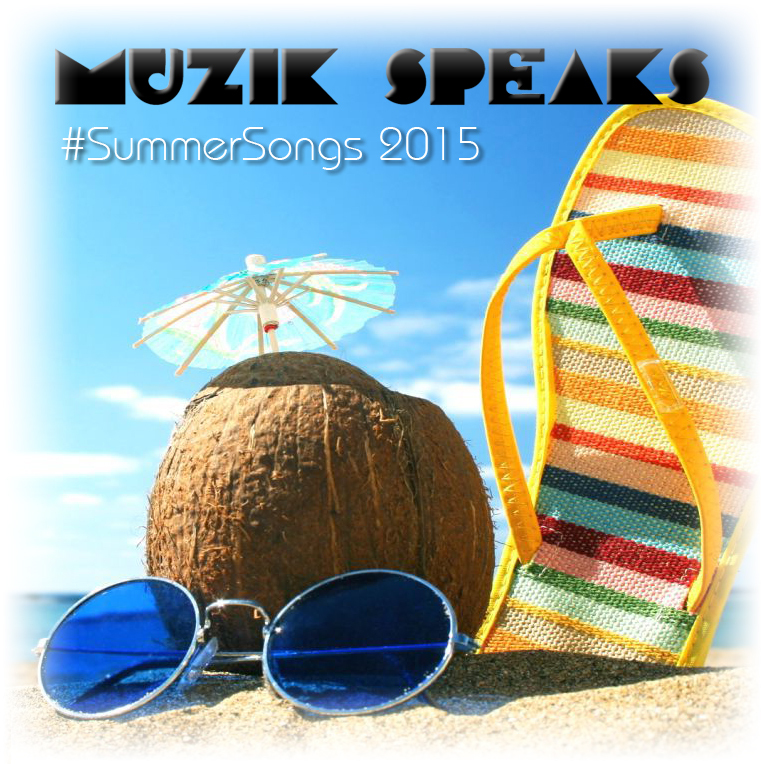 This weekend, we present you with our first ever #SummerSongs playlist for 2015! This playlist has been lovingly crafted by the current Muzik Speaks writers, each contributing some summery songs we love! There are so many songs on this playlist that I just love! They’re either current songs which right now are giving me that summer feeling, or are a few years old but hold memories for me. Jason Derulo – ‘Try Me’ featuring Jennifer Lopez and Matoma – this song’s got a distinct dancehall sound and captured me instantly. The song is on Derulo’s new album, Everything Is 4 and although it’s an album track, it’s the perfect opening track for our summer playlist! Sam Smith – ‘Lay Me Down (Tiësto Remix)’ – this remix is incredible! I’m a big fan of remixes anyway, but Tiësto’s euphoric, spacious sound on this track, has transformed an already beautiful song, into a electronica dream! Walk The Moon – ‘Avalanche’ – an album track from their latest release, Talking Is Hard, this song’s guitar sounds make it an upbeat, melodic song. It reminds me of something out of a sunny scene in Made In Chelsea or on the beach. One Direction – ‘Stockholm Syndrome’ – OK, so I feel I should justify this selection! One Direction, no matter what you think of them, have written some damn good songs; this being one of them! This song has a clear 80s quality to it, it sort of reminds me (not sure why!) of Climie Fisher‘s ‘Love Changes’. Tyler James – ‘Why Do I Do?’ – I used to love this song when it was released back in 2004 and the jazz-pop qualities of this song are unique and captivating. It’s damn catchy too! Fall Out Boy – ‘Favorite Record’ – I love Fall Out Boy and they have gone from strength to strength over the years. I love the production on this track and its use of certain effects on the vocals and guitars make it intriguing to listen to. It’s lyrics are also fairly reminiscent and that for me is a quality of summer; making memories to reminisce in years to come. Michael Jackson – ‘Love Never Felt So Good‘ featuring Justin Timberlake – this song has previously been a #FeelGoodFriday track of mine and it’s not hard to tell why! It’s a perfectly sculpted pop song with the uplifting sounds of Michael Jackson’s vocals, married with modern Timbaland production and support of Justin Timberlake’s voice. Razorlight – ‘Rip It Up’ – released back in 2004, this has many memories of countless parties I went to whilst at my secondary school and just makes me think of times I spent with friends. It’s energetic tempo makes for a hard-hitting belter. Vance Joy – ‘Riptide’ – this song is a personal favourite of mine; I was once shown this track by someone I admire for overcoming their fear of performing and its California surfing sound is the perfect calming close to our playlist. My other selections include songs by; Ariana Grande, Two Door Cinema Club, Train, DJ Fresh featuring Rita Ora, Sigma, Frankmusik, Clean Bandit and Shift K3Y. I’m really excited to share this playlist with you guys, it’s packed full of great tunes listen to this summer. Our selection is quite varied in styles and genres as we hope to capture all the highs and lows of your summer through the playlist. Dan Croll – ‘From Nowhere’ – this song is just far too cheery to not have in your summer playlist! The upbeat riffs and instruments make this song a good listen. Only Real – ‘When This Begins’ – to be honest I’m in love with this whole album. But this tune fits best with our Summer vibes, it’s probably one you’ll put on, sit back and relax to. If you like ‘Only Real’ be sure to check his feature in my #WildCardWednesday post. Toddla T – ‘Take It Back’ – although this song isn’t too recent, I think some clean Drum n Bass is essential for a good playlist. ‘Take It Back’ has some beautiful vocals over this great backing track. La Roux – ‘Uptight Downtown’ – This song grabbed me by it’s instrumentals, it’s on the verge of a pretty interesting ‘funk’ track. Also I personally love La Roux’s voice regardless, it’s so clean and natural sounding. Her songs should defiantly feature in your summer this year! SBTRKT – ‘IMO’ – this song is a little different to the others. It’s a very mellow tune, with an overall softness to the instrumental. It’s a beautiful song nonetheless, some really nice production went into this! These are all of the songs I’ve decided to choose for the summer; enjoy! We’ve gathered only the best songs which are sure to make your summer special. We want this summer to be one you’ll remember for the best reasons! Check out the full playlist on Spotify. We hope you enjoy it as much as we do! Today we’re bringing you a brand new track from Sigma featuring Ella Henderson (see our previous post about the remix of their previous song, ‘Changing‘, featuring Paloma Faith) and a great summery song from Conrad Sewell. Sigma are going from one featured celebrity vocalist to the next, creating their own path of smash hits and leaving some massive songs in their wake! The duo consists of Cameron Edwards and Joe Lenzie, who have so far worked with the likes of Labrinth, Paloma Faith and DJ Fresh and this next release of theirs features vocals of the incredibly talented, ex-X Factor contestant, Ella Henderson. ‘Glitterball’ is such a big-production song with its almost movie-like strings alongside chaotic drum and bass beats, a gospel choir and Ella Henderson‘s fantastic vocals. I’m predicting that it’s going to be a huge hit for them; a new landmark song for Sigma. Conrad Sewell recently gained recognition for lending his vocals to Kygo‘s hit song, ‘Firestone’ but he’s also released his own solo song, ‘Hold Me Up’. The Australian-born singer moved to America to work on his solo project and has worked on a bunch of hit-makers, penning this one with Brian Lee (who’s worked with Lady Gaga and Icona Pop), The Euroz and Lewis Bell. He’s also embarking on the Ed Sheeran tour around Australia. At the moment, ‘Hold Me Up’ has a tentative release date of 24th July 2015, however no pre-order has been made available yet. When it was released in Australia, the song peaked at 39 in the charts, however I reckon it’ll score a Top 20 in the UK charts, with the right promotion. Anyway, I hope you enjoy this song. And there ends this week’s #Two4Tunesday! Enjoy them as these are two really great songs! Please don’t forget to share away to your heart’s content across your social media accounts. This week’s #Two4Tunesday features two up-and-coming pop lasses, both of whom have a lot to offer the world of pop music and culture! Ryn Weaver is incredible! Born Erin Michelle Wüthrich, of Argentinian/American decent, she has quickly become an internet success story picking up recognition from Charli XCX and Hayley Williams (Paramore)! This sensational artist seemed to just emerge out of nowhere with her debut track, OctaHate, going viral. You may remember the original video where there was a little girl as her younger counterpart with some stunning imagery throughout. Sadly, Ms Weaver recently stated that she hated the original video and has since removed it online asnd replaced it with a new version in which she and her best friend have a food fight; it’s such a shame as the original video was one of my all-time favourites! However, since then, Ryn Weaver has released her follow-up track, The Fool, which is also the title track to her upcoming album. Once again, the video is heavily incorporated with artistic imagery and makes for a really interesting visual accompaniment. Ryn Weaver, as an artist, truly excites me; she not only produces interesting, unique and quirky pop songs but also visual masterpieces to accompany them, making for a fantastic re-defining of the word ‘artist’ in the music industry. I can’t wait to see what more she has in store for us! Next is the latest release from Ella Eyre. Ella trained at BRIT School and came to recognition for her collaborations with Rudimental, Naughty Boy, Tinie Tempah, Bastille and DJ Fresh but since then has released a string of Top 20 hits, the most recent being ‘Together’. This particular track has a fresh, summer feel with its calm verses and intense, drum and bass style choruses. This song confirms the incredible talent Ella Eyre has and that she deserves recognition for her talents. So here ends another #Two4Tunesday! Please remember to share the link to this post on your social media accounts and tell us what your two favourite tracks are right now. Thanks for the continual support!